Admittedly, I flippin’ love Pop Tarts. I know that they are not a good healthy breakfast food, but I just can’t help myself. I love the sweet icing, I love the fruit filling, and I can eat them any time of the day. But the traditional, low-fat pop tarts have 4 Weight Watchers Points each. Not a tremendous amount of Points, but when you are getting pretty much zero nutritional value from it, is it really worth it? So when I found these yummy, high fiber pop tarts, I was super excited to share them! These babies have 5 grams of fiber per pop tart, so not only are you getting 20% of your Daily Value of fiber, but they actually fill you up a bit more because they are so high in fiber. And they taste AMAZING. The best part is that they have only a 3 point value per serving, vs. 4 Points in the low fat pop tarts. So, what product am I talking about? Read on!! These rockin’ breakfast pastries are none other than the fabulous Fiber One Toaster Pastry! They come in 4 fantastic flavors: Blueberry, Chocolate Fudge, Brown Sugar Cinnamon and Strawberry, and all have just a 3 point value per serving. Pop them in the toaster and eat them warm, or just eat them straight out of the box. Either way, they are sensational, and you’ll be so glad you gave them a try! So if you are looking for a good Weight Watchers breakfast food or Weight Watchers snack, get yourself some of these Fiber One Toaster Pastries. They taste great, will fill you up and all the fiber will help keep your digestive system on track too! Do they still sell these? I haven’t seen them in a really long time and was wanting to buy some. Thanks. Not trying to be rude, but this should NOT be filed under vegetarian! Vegetarians aren't allowed to have gelatin (or glycerin usually), and the icing in these poptarts has gelatin in it, so these are NOT suitable for vegetarians. Corn Syrup, High Fructose Corn Syrup,Vegetable oil (Palm, Canola), Polydestrose, Vital Wheat Gluten, Glycerin, Modified Corn Starch, Leavening Agents (Ammonium Bicarbonate, Baking Soda), Red 40, Blue 1 and Other Color Added, Natural and Artificial Flavor, Gelatin, Enzyme Modified Soy Protein, TBHQ added to preserve freshness. These are by far, not good for you at all. Yuck!! Pop Tarts actually came out with their own high fiber pop tarts. 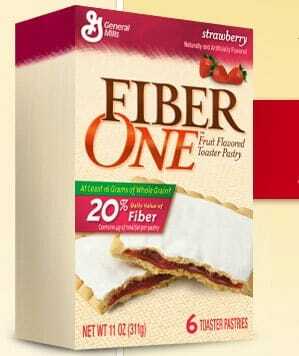 They are the same calorie, fat & fiber as the Fiber One Tarts. They sure did…I guess they finally realized what a good thing Fiber One had going! Is it one pastry per serving? Yes, that is correct, each individual pastry has a 3 Point Total. Beware – there are 2 pastries in each little foil envelope! Just because something is low in Weight Watchers points does not mean that it's healthy. That also goes for bread, cookies, and milk replacements; really, any processed food. I love these! I eat the brown sugar ones and the fudge ones. These are amazingly delicious!!! They and a ww yogurt are my breakfast and I really feel like I am starting the day out right. I have tried them all and like them all but I LOVE the chocolate ones the best. I think they taste like the real thing- Fiber One did great making them! I have the biggest sweet tooth, so as soon as these bad boys were stocked at my grocery I was grabbing them by the arm-load! My favs are the Brown Sugar Cinnamon and the Strawberry, and I prefer them cold. I'll even put them in the ice box for a few to chill them off. Great review, love the blog!